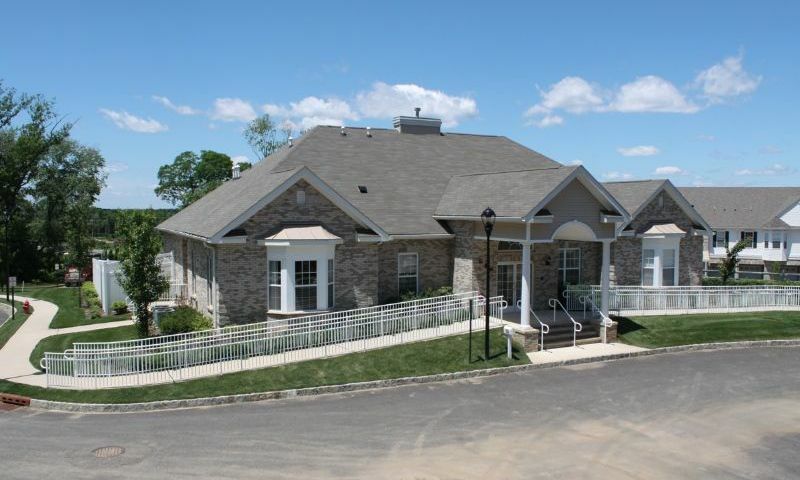 Chelsea Square is Marlboro Township's premier condominium community that offers a superior lifestyle for active adults. Within 20 minutes of the Jersey Shore and situated off the Garden State Parkway, this neighborhood of mid-rise condominiums offers carefree living among some of the area's best local venues. Dine at local restaurants or shop at the Woodbridge and Freehold Raceway malls, both of which are located just minutes away. This charming neighborhood for adults aged 55 and better is comprised of 225 condos. Chelsea Square includes a clubhouse, walking and biking trails, and a full-time activities director. For off-site recreation, residents have access to a variety of private and public golf courses in proximity to the community. Chelsea Square is home to an 8,900 square-foot clubhouse. Active adults can work out in the aerobics room or in the separate weight room. The facility also includes a massage room and locker rooms for men and women. Residents also have use of a business center with computers where they can stay in touch with long-distance friends or take care of necessary transactions before relaxing and enjoying all the other amenities. Social areas include game rooms, a catering kitchen and a multi-purpose room. For relaxing during the warmer months, Chelsea Square offers a heated outdoor swimming pool and patio. There are also walking and biking trails for early morning jogs or a leisurely stroll throughout Chelsea Square. Regal Homes offers seven innovative home designs that range from 1,482 to 1,918 square feet. These condos have one to three bedrooms, two bathrooms, and two-car garages with large storage rooms. The layouts feature world-class kitchens, great rooms, laundry areas, dining rooms, master bedrooms with walk-in closets, balconies, and optional gas fireplaces. Buyers can select from assorted resale inventory and new construction homes with individually upgraded features. Homeowners of Chelsea Square in Morganville have the satisfaction of owning a beautiful condo by a builder who takes pride in delivering the highest quality homes while exceeding buyer's expectations. The community provides the residents with options of partaking in as many activities as they want and are welcome to continually plan social events for all. Numerous interest groups and clubs meet regularly and, with a full-time activities director, residents can get excited over a constantly-changing social calendar. Interests covered include card games, hobby groups, book discussions, and aerobics as well as events like wine & cheese socials. Located off Route 79, Chelsea Square is within two miles of the Matawan Train Station. Other public transportation options include rail, bus, ferry and air service. The community's proximity to the Garden State Parkway and the New Jersey Turnpike makes for a quick commute to the Jersey Shore as well as to Atlantic City. Marlboro Township has 12 parks as well as a town center and offers free outdoor summer concerts. For year-round entertainment, the Count Basie Theater in Red Bank, the NJ State Theater in New Brunswick and the PNC Bank Arts Center in Holmdel provide popular options. Cities within a 15 mile radius of Marlboro include Freehold, Old Bridge, South River, East Brunswick, Asbury Park and Long Branch. Chelsea Square is also within 30 miles of Jersey City and New York, and within 55 miles of Philadelphia. For long distance travel, Newark Liberty International Airport is a 45-minute drive from Chelsea Square. Chelsea Square in Manalapan, New Jersey is the perfect 55+ community for active adults seeking charming condos in an intimate setting. Clubhouse - 8,900 Sq. Ft. There are plenty of activities available in Chelsea Square. Here is a sample of some of the clubs, activities and classes offered here. Chelsea Square offers seven floor plans as new and resale options that range in size from 1,482 to 1,918 square feet. These modestly-sized units feature one to three bedrooms, two bathrooms, and a two-car garage. We love this little neighborhood. It is very private (gated) and it's hard to come by a resale home here. We bought last year and feel really good about our investment. Good prices, nice amenities and a great location. 55places.com is not affiliated with the developer(s) or homeowners association of Chelsea Square. The information you submit is distributed to a 55places.com Partner Agent, who is a licensed real estate agent. The information regarding Chelsea Square has not been verified or approved by the developer or homeowners association. Please verify all information prior to purchasing. 55places.com is not responsible for any errors regarding the information displayed on this website.